This snapshot was taken near Aswem, Goa, on a fine February morning in 2010. It is actually a freeze frame from a Flip recording. 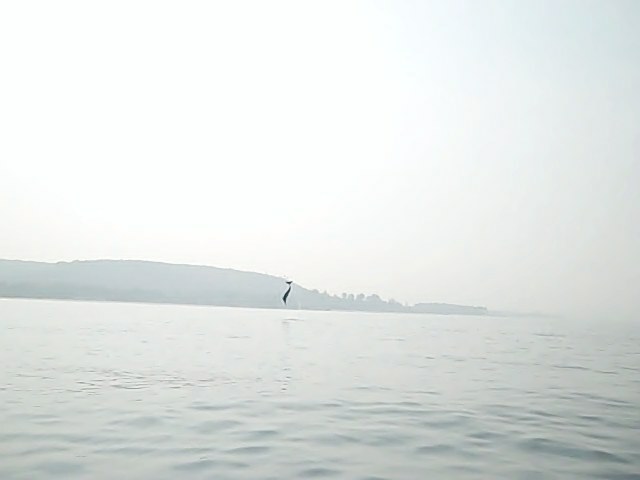 The dolphin did several complete somersaults. It was an amazing show, with several other members of the pod joining in. This being the 150th anniversary of Rabindranath Tagore’s birth, it feels propitious to have chanced upon this photograph now. 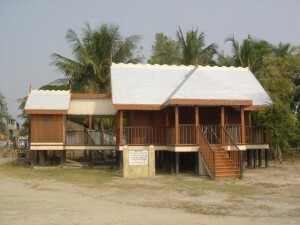 The picture is of the little house that Tagore stayed in when he went to visit Gosaba, in the Sundarbans, in December 1932. The house was built especially for him by Sir Daniel Hamilton, the Scottish shipping magnate who founded the settlement. Note the little stilts: Sir Daniel’s own house in Gosaba was also built on stilts, and there are many who believe that this feature is responsible for the preservation of these structures. The Sundarbans are a famously cyclone-prone area and Gosaba has been hit many times by storms of extreme violence: while many, apparently more solid, buildings were swept away, these fragile wooden structures somehow withstood the winds. The theory goes that the gap between the earth and the floor allows the winds to pass through without causing serious structural damage. Sir Daniel had many odd and interesting ideas (some might call him a visionary crackpot). He envisaged Gosaba as an agricultural (and educational) co-operative and Tagore was influenced by his ideas. In a 1930 letter to Sir Daniel, Tagore wrote: ‘I have not much faith in politicians when the problem is vast needing a complete vision of the future of a country like India entangled in difficulties that are enormous. These specialists have the habit of isolating politics from the large context of national life and the psychology of the people and of the period. They put all their emphasis upon law and order, something which is external and superficial and ignore the vital needs of the spirit of the nation…’ [from Selected Letters of Rabindranath Tagore, ed. Krishna Dutta & Andrew Robinson, p. 382 – by an interesting co-incidence the letter is addressed to Sir Daniel Hamilton at Dartington Hall in Devon, England, where a huge Tagore Festival is being held this year]. My father’s ‘middle-elder-brother’ (my ‘mejojethamoshai’) was the last manager of the Hamilton estate in Gosaba – thus arose my own connection with the Sundarbans. 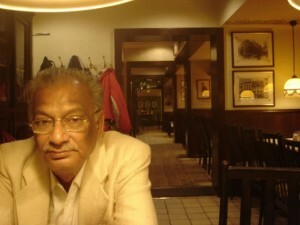 I was especially close to one of my uncle’s sons, Subroto Ghosh. ‘Kajolda’, as we called him, was much older than me: he grew up in Gosaba in the 1940s and ‘50s, and was radicalized by the extreme poverty of the area. He became a political activist and broke with his father. After getting into trouble with the authorities, he somehow ended up in Berlin, in the 1960s – he used to tell wonderful stories about marching in demonstrations with Daniel Cohn-Bendit (known as ‘Danny the Red’ to people of my vintage – he has since become ‘Danny the Green’ and is a leader of the Green Party). For many years Kajolda ran a little souvenir shop in Berlin. But he wasn’t much of a businessman and people sometimes took advantage of his generosity. The shop failed, but Kajolda lived on in Berlin, in a little room in Charlottenburg. When the weather permitted he would walk down to a little park where retired migrants gathered, mainly Turkish, and tell stories in German about the Sundarbans and the Sixties. He was eccentric in the way of solitary men, but he was also kind-hearted and good-natured: what’s more, he was a wonderful story-teller. When book tours took me to Germany I spent a lot of time with him: I think this picture was taken when the German translation of The Glass Palace was released. Some years ago Kajolda came to Kolkata on a visit and we went to Gosaba together: he had not been back in some fifty years. It was a moving occasion, and I remember vividly that he especially wanted to visit the house that Tagore had lived in. That was when I took the picture above.